This is not a test, it is a training course, and validates your driving licence provisional entitlement to use the public highway as a lerner motorcyclist. You do not pass the CBT, you complete it. The course usually lasts a day and is a made up of five elements. * A few hours Road riding under radio direction from your instructor. If you have never ridden a powered 2 wheel machine before we strongly advise you attend anIntroduction to Biking course first. This will make your CBT course itself much more enjoyable. NO HIDDEN EXTRAS FREE use of Safety equipment, machine damage insurance and any continuation. 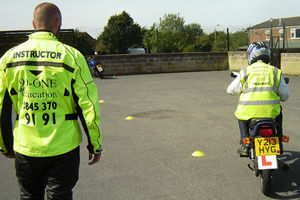 The CBT course or Introduction to Biking can be given as a gifts for birthday or Christmas. If your instructor thinks that you require longer than the one day course this to be safe, then you will be given further instruction at no extra charge. 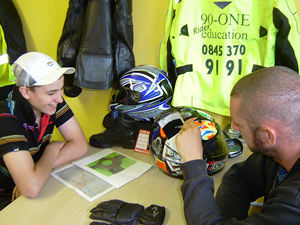 Following a successful completion of the CBT course, you are entitled to ride any bike (automatic or manual) up to 125cc (50cc if under 17 years of age), but you should be aware that you are still very much at the learning stage, and further supervised assistance should be built into your plans for the future. If you choose not to move on to take the DVSA 125cc motorcycle Test (Category A1), or progress onto a bigger motorcycle Direct Access (DAS) (Category A2 or A) you will need to re-attend and renew your CBT qualification after two years. 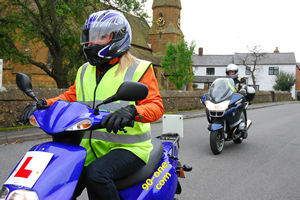 Did you know that 12 months road experience on a scooter / moped or motorcycle could save you a fortune in driving lessons and car insurance. If you are going onto driving lessons ? Read more about saving on driving lessons here. Please note new motorcycle licence restrictions came in on the 19th January 2013 which may affect you if your are wanting to take your motorcycle test. What do you need to attend a CBT course?. . . . . . See the My CBT Page. 15 Years old? why not get a head start with the Introduction to Biking course before you turn 16?